SINN FÉIN’S SUCCESS at the ballot box last month is likely to result in even more scrutiny of the party and its policies over the next few months and years. Chief among the attacks from opponents are that Sinn Féin’s budgetary policies are “fantasy economics” and “not credible”. The chief argument is that Sinn Féin proposes to abolish the property tax among other things yet has proposed no way of paying for the shortfall this would create. The question is whether the proposals, such as a third rate of tax at 48 per cent in incomes over €100,000 or a wealth tax, are realistic. Are the proposals costed properly? The government claims they aren’t, but Sinn Féin disagrees. 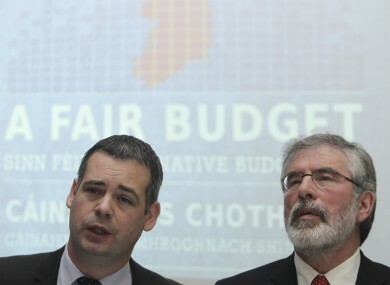 The party’s finance spokesperson Pearse Doherty said last year that the party’s numbers were costed by the budgetary costing unit of the Department of Finance and this claim has been reinforced several times since. Effectively: ’We can’t tell you’. But what the Department of Finance was able to say was that it “costs the individual measures [their emphasis] on their own merit (and on a standalone basis)” and provides the yield i.e. the amount of revenue raised for each measure. So while each Sinn Féin measure may well have been costed the overall economic effect of implementing all of the measures wasn’t. That is crucial to the whole idea of Sinn Féin’s economic proposals and how realistic they are. You can say policy X will cost Y and raise Z, but you can’t definitively say what impact it would it have on the wider economy. For that you’d need an expert, so we spoke to Trinity economist Ronan Lyons. It would be impractical to go line-by-line through Sinn Féin’s proposals so we decided to focus on big ticket items such as the proposal for a third rate of tax at 48 per cent on the portion of income over €100,000 which the Department of Finance said would raise €365 million. But the issue is what impact would introducing such a rate have on people’s habits. Lyons explained: “A good tax is one that doesn’t change people’s behaviour. Most taxes do have an impact on people’s behaviour. “Ireland already has one of the largest marginal rates of tax,” Lyons points out, saying that he would be wary of what he hears about multinationals based in Ireland struggling to attract executives because the marginal rate is so high – 52 per cent according to the OECD. Of the 48 per cent rate, he added: “It wouldn’t be a way to go from a competitiveness point of view. Of course economists never tend to agree on anything, so that view wouldn’t necessarily be shared by those who lean leftwards in the direction of Sinn Féin. Marie Sherlock is an economist at SIPTU who notes there is “common ground” between the union’s call for a third rate of tax and Sinn Féin’s. “However, to be more precise, ICTU and SIPTU have called for a targeting of the top 10% of earners in the country and alternative ways to generate savings is to phase out the personal tax credit above a certain threshold and increase the minimum effective rate,” Sherlock said. Other big ticket items that Sinn Féin talk about are wealth taxes. These include increasing capital gains tax to 40 per cent and increasing capital acquisitions tax to 40 per cent and lowering thresholds. When combined these measures raise €206 million. But one of the big policies is an actual wealth tax, which was excluded from the party’s budgetary arithmetic last year on the basis that the Department of Finance couldn’t cost it. But the party still strongly proposes its introduction. The proposal is to introduce a 1 per cent tax on net wealth in excess of €1 million with exclusions for “working farmland, business assets, 20 per cent of the family home and pension pots”. There is no exact estimate of how much this would raise but Sinn Féin reckons it is about €800 million in a full tax year. A wealth tax proposal is supported by SIPTU, Sherlock said, but not for the purposes of facilitating the abolition of the property tax. “All in all, while a wealth tax does merit consideration, we as a country remain far from having a strong grasp of what the stock of wealth is and how wide or narrow the potential tax base is,” she said. In any case Lyons believes that the proposal to tax wealth is already staring Sinn Féin in the face. In fact it’s the measure the party wants to abolish – the property tax. Real estate is not mobile. You can tax lavish property and a billionaire businessman cannot move it to Switzerland to avoid paying the tax on it that is owed in Ireland. Yet Sinn Féin is adamant that the property tax should be abolished, describing it as an “unfair, regressive form of taxation”. If in government the party would abolish it. Now it holds a degree of power at a local government it will look to do what it can to minimise the amount people have to pay in local property tax (LPT). This means reducing LPT by the 15 per cent that council’s have the discretion to do. Sinn Féin says its councillors are “mandated to do all they can to end this unfair tax. That includes reducing it by 15% in each council”. This is happening already. Earlier this month, Cork County councillors voted through a Sinn Féin motion to cut LPT by 15 per cent. Much like it would arise at a central government level, the question now is how does that council make up that lost revenue? When we spoke to one of Sinn Féin’s chief economic thinkers, councillor Eoin Ó Broin, before last month’s elections he told us that any party committing to cut a tax would have to explain “where the lost money will be made or what services they will cut”. When we put this seemingly contradictory stance to Sinn Féín this week we were told that councillors will seek to make-up the lost revenue from the 15 per cent cut in LPT “without reducing front line services or jobs”. “We will look in the first instance for central government to make up the shortfall. Given that many local authorities did not receive a single cent of property tax this year such a request would not be unreasonable. So Sinn Féin WILL ask central government to make up the shortfall, despite Ó Broin acknowledging last month that “central government isn’t going to make up that money”. Even if we act on the assumption that central government doesn’t make up the shortfall then Sinn Féin says it will will seek “efficiencies and reductions in office holders expenses”. But taking the example of Cork County, which took €25 million in LPT revenue this year, a 15 per cent cut would force it to find some €3.75 million in lost revenue. That’s lot of money to try and squeeze out of unspecified “efficiencies and reductions in office holders expenses”. The situation in Cork is just an example of what now faces Sinn Féin. The party has had success at the ballot box and has some degree of power at a local level. Now it must show that the proposed ’fairer’ alternative can actually be implemented. The evidence suggests it won’t be easy. Email “Shinnernomics: Opponents call them fantasy, so how realistic are Sinn Féin's budget proposals? ”. Feedback on “Shinnernomics: Opponents call them fantasy, so how realistic are Sinn Féin's budget proposals? ”.